The Penn State College of Communications was founded in 1985. Originally known as the School of Communications, the communications program proved so popular that it was officially made a college of Penn State University in 1995. In spite of the fact that it is now the largest accredited communications program in the United States, it continues to grow at a rapid pace. The College of Communications consists of four departments. Undergraduate students can pursue a bachelor’s degree in Film-Video and Media Studies, Advertising/Public Relations, Telecommunications or Journalism. Graduate degrees include a master’s in media studies as well as a Ph.D. program that offers a doctorate in mass communications with emphasis on international communications, media effects, law, government and politics, strategic communications or telecommunications, technology and information policy. Faculty members are chosen on the basis of their academic achievements as well as their professional success and are expected to devote themselves equally to teaching, research and service. Penn State is a recognized research institution, and the College of Communications is no exception, featuring seven research centers. Even undergraduates are given the opportunity to participate in research. The college makes a concerted effort to bring top academics and professionals in the field of communications onto the campus for lectures and other special programs. Penn State approaches communications education from a broad perspective, offering students in every major a combination of conceptual and applied courses. All Penn State students, regardless of major, receive a broad-based core education in addition to specialized courses tailored to their area of focus. The college takes a great deal of pride in preparing students for media-related jobs. 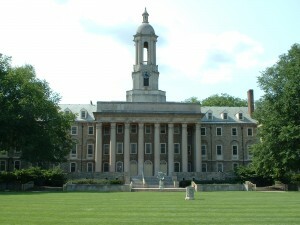 Penn State, known officially as the Pennsylvania State University, is located in University Park, Pennsylvania. The school also has a number of satellite campuses across the state, as well as a growing online presence. The university is considered one of the top fifteen public universities in the United States. It has long been considered one of America’s Public Ivies, a select list of public universities that provide an education that is comparable to that provided by an Ivy League University. With more than 44,000 students, Penn State’s main campus is one of the biggest in the nation. Including the university’s satellite campuses and online students, total student enrollment in 2009 was nearly 100,000. Penn State’s Nittany Lions, named after the mountain lions that once called the school’s main campus home, compete in the NCAA’s Division I. The school is a Big Ten university. Campus life is very social, with many students living on campus. Nearly 800 student organizations are officially recognized by the university, and roughly 12 percent of the student body is affiliated with one of the many Greek systems. One long-standing Penn State tradition is the Penn State Dance Marathon (THON), known as the largest student-run philanthropy in the world. Every February, thousands of students participate in a 46-hour nonstop dance marathon to raise millions of dollars for pediatric cancer treatment and research. Communications students at Penn State have a great deal of opportunity to practice their craft. The College of Communications itself runs ComRadio, which acts as an audio laboratory and is used as a training environment for communications majors. The station prides itself on covering most of the university’s sporting events. Other programming includes political coverage, talk shows, news and music. In addition, the school’s annual yearbook, one of the longest-running continuously produced student yearbooks in the nation, is student-produced, and so is the student newspaper, a blog and Phroth, the school’s humor magazine. Students also run another radio station, WKPS-FM, known as the LION 90.7 FM.